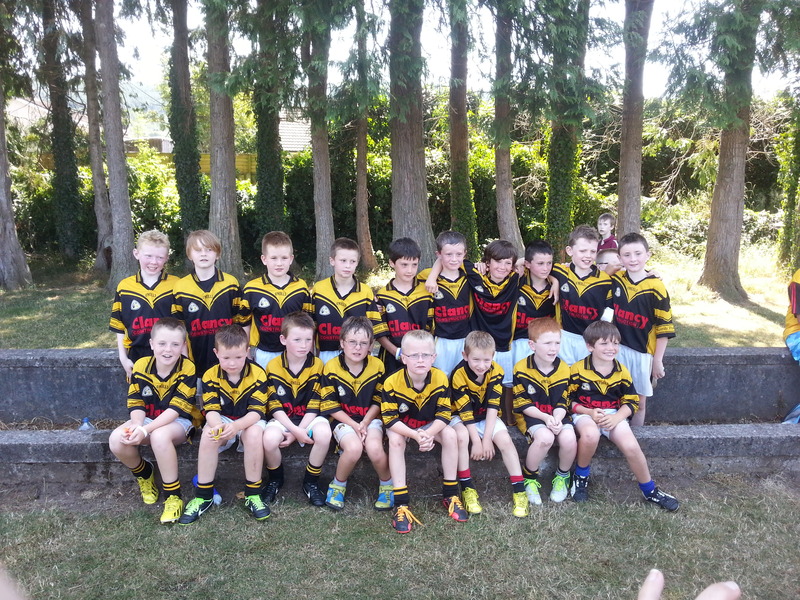 Our U10 footballers produced a number of fine displays in the South Grade B Football blitz yesterday in a sun drenched Kilsheelin. The Drangan/Cloneen boys won it out by defeating the home team Kilsheelin in the final. Seven teams were in attendance yesterday: St. Pats, Kilsheelin, Fethard, Ballingarry, Grangemockler, Killenaule, Mullinahone. The heat in Kilsheelin was very intense, averaging around 27C, so a blitz involving each team playing six games was a massive ask for all players. St. Pats started out the day against Grangemockler. Pats had the better of it overall but failed to convert their chances, due to extremely small goals! So it ended up a draw in the end with Grangemockler kicking the leveling point in the final minutes. Next up was Mullinahone; the Pats boys really stepped up the tempo here and produced a really good first half performance, attacking the ball at all times. Our lads really kicked on in the second half and secured a good victory; Pats 1-3, Mullinahone 0-2. Ballingarry were our next opponents. This was a dogged affair and we eventually came to the fore with a two point victory. It finished St Pats 2-3, Ballingarry 2-1. Then onto Killenaule. We were a point up early into the second half and Killenaule goaled which gave them momentuem. But the never say die effort for our lads paid off with us goaling in injury time and securing a one point victory. It finished Pats 1-3 Killenaule 1-2. At this stage we had three wins and a draw so we were going to be in the shake up. Fethard gave a us a walkover in the next game. So that put us into the final with the home team Kilsheelin who were also undefeated at this stage. In the final our lads started brightly with Brian O’Halloran goaling early. Momentum and confidence is key and we soon followed up with a second goal from Willie Cleere. We were on a role and Cathal Foley got our third green flag, followed up quickly by a Ryan Crannitch point. At he break we were 3-1 to 0-1 ahead. A dogged and totally committed second half from Pats secured a great victory, it ended up 3-2 to 0-2. The young Drangan/Cloneen boys should a great attitude throughout, with a great willingness to work hard and this paid dividends. Well done to all the boys on a good day for our club. Thanks to all the parents and family members for their support and help on the day keeping the young players hydrated. This entry was posted on July 21, 2013 at 1:05 pm and is filed under Football. You can follow any responses to this entry through the RSS 2.0 feed. You can leave a response, or trackback from your own site.